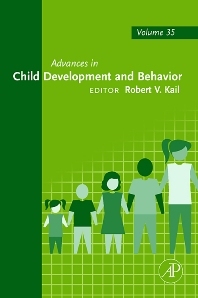 Volume 35 of the Advances in Child Development and Behavior series is divided into nine components that highlight some of the most recent research in developmental and educational psychology. A wide array of topics are discussed in detail, including Cognitive Mechanisms, Episodic and Autobiographical Memory, Emotional Security Theory, Working memory and much more. Each component provides in depth discussions of various developmental psychology specializations. This volume serves as an invaluable resource for psychology researchers and advanced psychology students.